Informal interactions flourish during CampusCouches, one of three initiatives from TableTalk designed to encourage communication across social and cultural barriers. Emory Photo/Video. What if a world of misunderstanding could be healed with a conversation? It might start with putting down that smartphone — for even five minutes, please — and plopping down on someone's couch and listening, really listening, to what they have to say. And talking. Remember talking? That easy engagement that used to come from taking the conversational ball and running with it, no technology required? That's the idea behind TableTalk, a series of student-led initiatives taking shape at Emory this year that offer a framework for cross-cultural conversation, harnessing the power of one-on-one dialogue to intentionally bring together people who otherwise might not have an occasion to meet or interact. CampusCouches: Inspired by the FreeConvo movement in New York City, couches are scattered about campus to invite casual, unstructured conversation. Behind it all is the delicate act of breaking down barriers — both real and imagined — that might otherwise prevent Emory students from stretching beyond their immediate social circles to engage with new faces, cultures and ideas. "You go to college to get pushed out of your comfort zone, to learn about people and ideas that you haven't come into contact with yet — that's why we came from all over the world to attend this institution, to get pushed," explains TableTalk co-founder Adam Goldstein, a junior from Boston majoring in American history and business. "People have sometimes said that Emory doesn't have enough diversity," he says. "We say it has a lot of diversity, we're just not taking advantage of it and stepping outside of our comfort zone." "We'll know TableTalk has worked when groups and individuals who have historically had nothing to do with each other begin to have everything to do with each other," he adds. Tabletop clings in the DUC offer conversation starters and encourage students to “LookUp,” put down their phones and talk over a shared meal. Photo by Yash Patel / courtesy of TableTalk. Ami Fields-Meyer, TableTalk's other co-founder, will tell you that he grew up in Los Angeles in a very tight-knit Jewish community "with people who looked like me and talked like me and ate the same food that I did." In fact, the opportunity to explore new people and cultures in a different part of the country was a primary reason he chose to attend Emory. "Why did I come 3,000 miles to Georgia if I was just going to stick around with the same people?" says Fields-Meyer, an Emory College junior majoring in American history. In the classroom, Fields-Meyer has found the full benefits of a liberal arts education. "We know that the university is a laboratory of thought in classes, books, reading and discussion — an exchange of ideas on a very unrestrained level," he says. But for a student to have that kind of experience outside the classroom, "in the places we inhabit and eat in, just didn't exist in the same way," he adds. "The framework just wasn't there." Together, Goldstein and Fields-Meyer decided they could "sit around and think about it or actually go change it," Fields-Meyer says. "Everyone has an opinion, everyone wants to talk, but we haven't always had the channels." The answer to that problem took root last year, when Goldstein was enrolled in Emory's Community Building and Social Change Fellowship program, which introduces students to challenges and opportunities for building community through academic coursework and field experience. In the classroom, Michael Rich, professor of political science and executive director of Emory's Center for Community Partnerships, had often used the term "bringing everyone to the table" — the need to ensure that all parties with a stake in the conversation taking place are, indeed, there. From that phrase sprang a random thought: "What if there was a table in the middle of campus and all the right people went to it?" Goldstein wondered. When he shared the idea with friends, they laughed. But later, in conversation with Fields-Meyer, he brought it up again: A big table, in the center of campus, with room for everyone. "That's a great idea!" Fields-Meyer told him. "Why have you been hiding it from me?" During winter break last year, Fields-Meyer went to visit Goldstein in Boston to hammer out a proposal to invite Emory students into conversation with each other. They began by inviting the presidents of about 20 campus social and cultural organizations to attend a focus group in January. "We gave them the proposal and said, 'We're two white upper-middle class, coastal city Jewish kids. Tear this apart. What's not going to work? Is this something Emory needs?' " Fields-Meyer recalls. In return, they received "very constructive feedback, super positive," he adds. Within weeks, they were piloting two "TableTalks," facilitating candid conversations about identity, first between Emory's Muslim Students Association (MSA) and Buddhist Club and then between Emory Hillel and Brothers and Sisters in Christ (BASIC), a black Christian fellowship group. It was important not to dictate the meetings, they decided, but to let each group decide who they wanted to interact with, Goldstein says. TableTalk facilitators met a week before the gathering with leaders from both groups to discuss the format. They also dealt with finding a neutral space, a table and food. "We're not saying, 'Hey, the Muslims and Jews should talk' — that would be presumptuous," says Fields-Meyer. "We just created a framework for it to happen and facilitated it." "We have each leader give a brief description of their group or culture, then open the conversation," he adds, exercising what he calls "the freedom to ask." "Anyone from either group can ask questions; we're agreeing not to be offended," he explains. The reaction, he says, was overwhelmingly positive. "Every TableTalk we've conducted has run over our time limit," says Fields-Meyer. "People left saying, 'I can't believe I've never done that before. Can we keep talking?'" 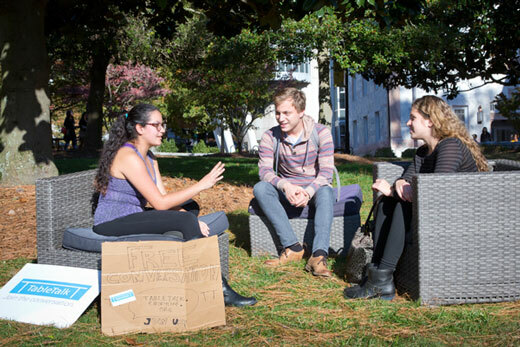 This semester, they've expanded offerings to include CampusCouches, an impromptu invitation to sit and talk on campus, and LookUp, which urges the Emory community to lay down their smartphones and engage with one another over a meal in the DUC — table-top clings provide questions with prompts to get things started. "Dining on a campus is radically different than dining anywhere else," says Dave Furhman, senior director of Emory's Food Service Administration. "We are here to create community and help the community create a dialogue with each other. What better place to do that than over a meal?" Emory President James Wagner is among those who have stopped by CampusCouches for the chance to sit and chat. Photo by Dottie Stearns / courtesy of TableTalk. On a recent fall afternoon, Emory junior Will Russo lounged on a well-used sofa watching students stream through Asbury Circle — one of several locations around campus strategically chosen to draw the attention of passers-by. The couch, which had been hauled over that morning from Goldstein and Fields-Meyers' Alpha Tau Omega fraternity house, sat on the grass in the sunshine. On a sign, a simple invitation: Join the conversation. One of several student volunteer facilitators, Russo was an early enthusiast of the idea; this semester, they've received facilitator applications from about 30 Emory students. Sometimes he will meet strangers. Often, friends who know Russo, but not each other, will stop by — an opportunity to make new introductions. "I like that this was a different idea that tackled an issue that a lot of people talk about," Russo says. "I'm a person who likes to keep learning. I didn't come to college not to learn something about people." On this day, Student Government Association (SGA) President Jon Darby stops by to talk. The SGA and Emory's Division of Campus Life have both supported the TableTalk program, Darby says. Darby praises the program for helping ignite "organic, casual conversations." "This is something really great for our community. People feel safe and comfortable talking on a couch. The atmosphere feels more open, less stuffy," he says. Among student volunteers who help guide the couch conversations, almost everyone can pinpoint a moment of particular insight. For Goldstein, it was the time he visited with a student from South Korea outside of Cannon Chapel. "He's really active at his church here at Emory, but didn't grow up especially religious, which was similar to my own experience," Goldstein recalls. "We had a deep conversation about what draws you to religion when you come to college." For Fields-Meyer, one highlight might have been the day that Emory President James Wagner stopped by to chat and the conversation turned to music. "My friend Nick was talking about singing in a choir, I mentioned that I've sung in an a cappella group and (President Wagner) said, 'I sang a cappella too,'" Fields-Meyer says. "It was cool, a really nice moment." "I found out later that my mom wrote him a thank you note for sitting on the couch," Goldstein adds, laughing. For now, Goldstein and Fields-Meyer are intent on building a strong campus organization. Applications for TableTalk student facilitators are being accepted through Nov. 14 . But they've also attracted wider interest and have been approached by other campuses interested in their template. "We may be looking at ways to develop a tool kit and expand," Fields-Meyer says. "For me, college has been about trying to figure out what I want to do and trying to be okay with not knowing what I want to do. What I want to do right now is find ways to build these intentional communities."